Market research firm Net Applications released its January report, in which iOS (s aapl) reached a new high of 2.06 percent in market share as measured by web browsing. That’s up from 1.69 percent last month, a 22-percent increase, and another indicator that Apple won Christmas. 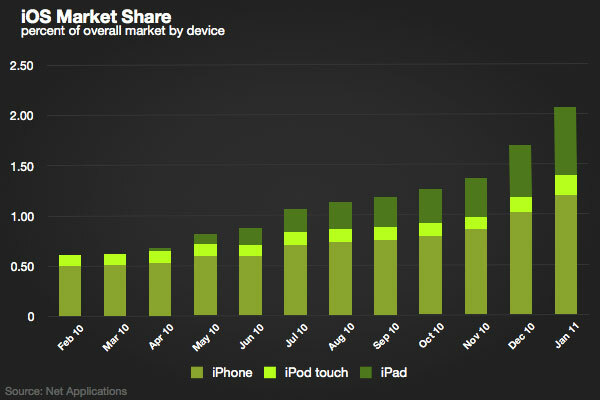 Both the iPod touch and the iPad saw gains of approximately 30 percent from last month, now at 0.20 and 0.67 percent of the overall market. Having just topped one percent last month, the iPhone alone now represents 1.19 percent. If these numbers seem meager, even combined, a two-percent share is nonetheless enough to take third behind OS X, though that may change soon. At the end of 2007, iPhone OS representation was barely measurable, about 0.06 percent of the overall market. 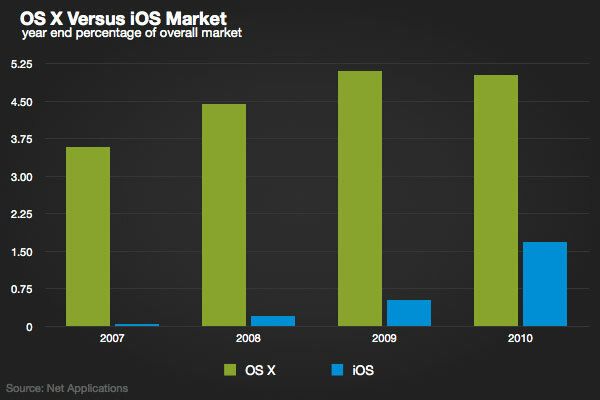 OS X’s meager 3.75 percent dominated iPhone OS. Three years later, OS X actually showed a slight decline from the end of 2009 compared to 2010, ending at just over five percent. In sharp contrast, iOS has had three straight years of strong growth (between 150 and 200 percent), and is looking to add a fourth. What this means is that with a little luck — OS X jumped to 5.25 percent for January — by the end of 2011 one out of 10 devices accessing the web might be made by Apple. Unfortunately for Apple, its devices aren’t the only ones seeing growth. Android (s goog) is unstoppable. The latest hard numbers from NPD saw Android take a majority of smartphone market share in the U.S., 51 percent, while Apple slid from 23 percent to 19 percent. Net Applications data on web browsing share also shows the steady rise of Android smartphones. While iPhone share climbed 17 percent in January, Android saw an increase of 44 percent, on top of a 30 percent increase in December, and that’s just smartphones. Despite admission from Samsung that the Galaxy Tab actually sold far less than the two million units shipped so far, better Android tablets running optimized Honeycomb will be available from multiple manufacturers this year. Add to that Android rivals to the iPod touch, like the Samsung Galaxy Player, and it seems certain that no matter how much iOS grows, Android will grow more. 2011 will likely see Apple reach a high point in web browsing share, but 2012 most likely belongs to Android. Yes, expect it to happen. The iPad launch outperformed the iPhone. They sold 3 million units in 80 days. They’ve sold How about 10 million in 2010? Would that “definitely be a success”? Seriously, enough with the goofy anti-Apple predictions – you’re batting .000 now. 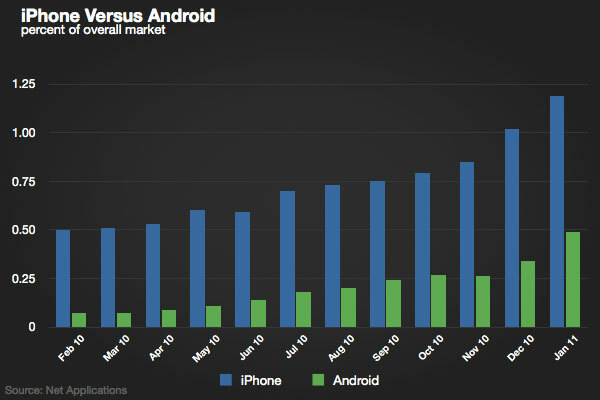 Android isn’t going to overtake Apple. The iPad isn’t going to fail. And yes, there will be lines at the Apple store. Here’s a tip: start predicting Apple’s successes, then you’ll start getting it right. Until then, you just provide lots of BWAHAHAAHA fodder for Apple fans. The world map of the market shares of iOS and Android on a per country basis is available at http://www.browserrank.com. iOS is still struggling both in terms of mobile OS and mobile Browser. Competition is good. Nuffield said….. It has terminal cancer and it will stop itself.